Just an idea. Never developped. I loved this work since the first time I came into it, I'm learning 3D modelling, would you mind if I practised using it? No. Go right ahead. Let me know how it turns out. Very cool and very vivid. Your artwork is really eye catching! Completley outside the realm over sized axes and armor with spikes. I like that. Ardapedia, the German-speaking Tolkien-Wikipedia is in a process of polishing their articles with professional artwork. So I am searching in Deviantart for artists who may allow us to use their work in a, of course, non commercial way. The consent of the artists is very important to us. Copyright and ownership of course would be marked so no one else could claim it. Could I use some of your works for this purpose? I look forward to a positive answer. 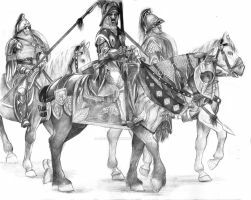 I used your picture to illustrate an amateur game "profile" on a french forum (about Games Workshop LotR game) it's supposed to illustrate a "Man of the City" (as Tolkien call the soldiers of Minas Tirith who are not Guards of the Citadel neither from the fiefs), I consider them to be something between a highly trained militia and professional warriors (since they fight on a regular basis to defend Osgiliath or Cair Andros) used as the typical soldier of Gondor at the time of the Stewards is that allright ? If you were thinking to an earlier time than the regency of the Stewards and want your picture to be associated with an earlier period, that's allright, let me know. And if you want it to be removed that's allright too. I consider this an illustration of the standard soldier serving in the Gondorian army, whatever the time frame during the third age. He is not a militia man, but a professional soldier. A heavy infantry man to be more precise. I don't mind you using the image provided you're not profitting from it. 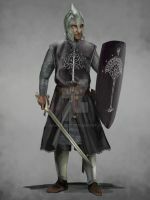 Well my interpretation is that the only professionnal soldiers in Minas Tirith at the end of the Third Age are the Guards of the Citadel (a few hundred already) but I understand some might see things differently, so I might use it to illustrate a soldier of Gondor at the time of the kings, that'll be more appropriate. Indeed the fact he is one-eyed give the feeling of a veteran of many wars, which doesn't fit a militia man. No, I am not making any profit, neither is anyone on that project. It's only an unnoficial rewriting of the rules intending to make them closer of the books. It's good enough as b&w illustration, shows a guy who's been around the battlefield a few times. I've seen worse published in actual game books. Including some who should have known better. *Stares hard at ICE. * You must be a re-enactor, or someone who goes to Faire properly dressed. The layering and arrangement of the kit suggests someone who's worn it, not just copied pictures from a book. Well keep it up, everything looks great! I had wondered, since you had done a good job with the layering, put equipment in places where it would be worn well, and even included a belt pouch. 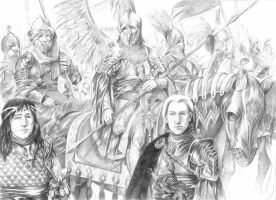 I think they pictured the Gondorian Soldiers in the Movies quite poorly, they were packed in good plate armor, but where basically useless compared to the Rohirrim Warriors of Rohan. I believe that has less to do with how well they were armored and more to do with creating drama and tension and a sense of hopelessness. Which makes the heroics that much more stronger. But, you're right they caved in like a house of cards. 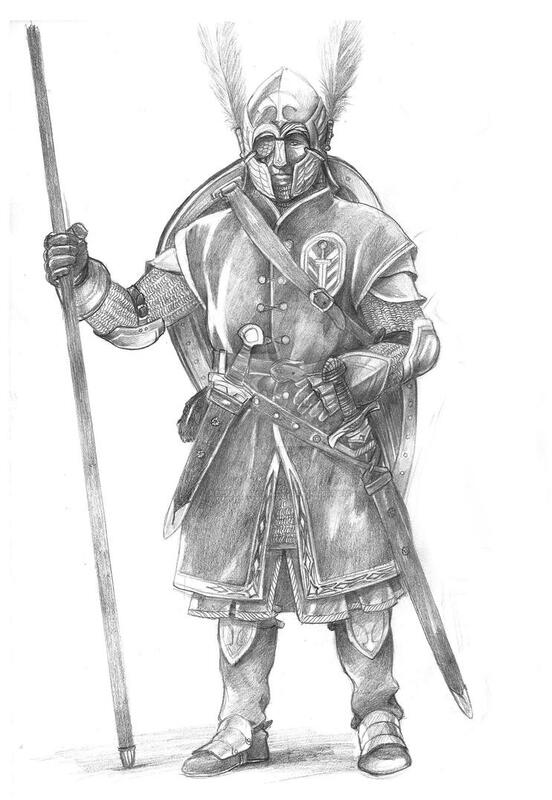 That's an awesome-looking Gondorian soldier. There must be something wrong with me, because I feel his legs are a bit short, but I assume that is down to the length of the tunic rather than the anatomy. One of a variety I've worked on. It does appear that way, but no. It's just the tunic. This is an awesome sketch. Very nice touch with the eye-patch! Thats awesome. You should do something with this, its a good character design.